The UbiSlate 7Ci. (Image: DataWind). It’s been a little over two years since Canadian device maker DataWind first began selling its Aakash tablet in India at a price tag of $47, in a bid to bring Internet connectivity to millions of people who couldn’t otherwise afford access to it. 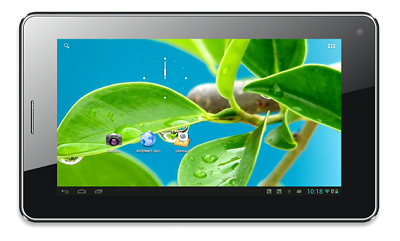 Two weeks after the Aakash tablet first launched in October 2011, DataWind had sold 1.4 million units. And today, it’s entrenched itself as a major player in India – it often outpaces Apple Inc.’s iPad two to one in tablet sales and competes neck-to-neck with Samsung Electronics Co. Ltd. for market share, says DataWind CEO Suneet Singh Tuli. But now, DataWind is looking to expand its selling strategy. In December 2013, the Montreal, Que.-founded company began selling three of its devices in North America and the U.K.
Running the Android operating system, the UbiSlate 7C+ and the UbiSlate 3G7 are priced at $80 and $130, respectively, with these two models labeled as “phablets,” or hybrids of phones and tablets. Even more attractively priced is the UbiSlate 7Ci, a tablet which goes for a neat $38, plus $16 in shipping and taxes within Ontario. DataWind sells the tablets from its site, www.ubislate.ca. But although the price is undeniably good, the UbiSlate tablets are targeted towards a very specific demographic – students and individuals from low-income backgrounds, Tuli says. For the past two years, DataWind has been working with NGOs like the Level Playing Field Institute and Geeks Without Bounds, which aim to help inner-city youth get a handle on their education through technology. “The whole proposition is meant to try to make affordability to a level, not so you and I can afford them, but for those who want to get on the Internet, but are not able to because cost has been a barrier,” he says, adding DataWind offers data packages for the 7C+ and the 3G7 in the U.S. by partnering with U.S. carriers, but it hasn’t forged any such partnerships with carriers here in Canada yet. To keep manufacturing costs down, DataWind builds its own touch screens and focuses more on providing services, content, apps, and advertising. The company’s margins for its hardware are also quite thin, but it’s happy to avoid markups and to keep them that way. For example, while a tablet might be made for $40, a device maker would still need to make money off of it. So it might hike up the price by $20. But then, there are margins for distributors and retailers, and at the end of the day, you might be looking at a final retail price of $130, Tuli says. Essentially, the plan is to ensure the final product is one that fits a low budget and yet still has all the right features. For example, an entry-level DataWind tablet lacks an HDMI port, as many of its customers don’t use HDMI. Nor is the calibre of their processors particularly impressive by today’s standards. The UbiSlate 7Ci is powered by a Cortex A8 1 gigahertz (GHz) processor – something comparable to what Apple’s first iPad was using when it launched in 2010. Still, low-cost tablets like these are pushing the limits on what’s possible in the fiercely competitive market of consumer electronics. “There’s always this question of, why make low-end products or low-cost products. And for us, when we consider the next generation product, the first thing we start with is price,” Tuli says. Look for IT Business.ca’s review of the UbiSlate 7Ci later this month.